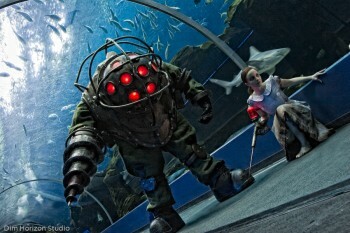 The man who created the life-sized Big Daddy suit tells Irrational Games that the project was more challenging than he expected, but things didn't get really ugly until he actually had to walk around in it. Harrison Krix is a talented man. He's built a Little Sister ADAM syringe, a Fallout 3 laser rifle and an amazingly detailed Portal gun, but he's best known for his utterly ridiculous, awe-inspiring Big Daddy "Bouncer" costume. It's a full scale suit, with a working drill arm and glowing red helmet portholes, weighs over 50 pounds and took nearly two solid months to build. Oh, and it was apparently a little slice of hell to move around in, too. Krix said he and his wife were putting the finishing touches on the suit right up to the very last second before transporting it to the 2009 Dragon*Con, a process which ended up taking two trips in two vehicles because of the sheer size of the thing. After "a comedy of errors" that ensued when the team arrived at their hotel, which included missing dome screws and dead batteries for the internal fans, he finally got the costume on, at which point the real unpleasantness began. "[Walking around was] a solid nightmare. With the arm extension and drill you can't actually use your hands for anything. There are seven-inch lifts and 55 pounds of suit hanging off your back. And the positioning of the leg holes meant I could only take short, shuffling strides," he told the Irrational Insider. But it wasn't all bad. "It's hot and heavy, you're pretty much blind and deaf inside, my hair got caught in one of the fans a bunch of times, you can't pee or scratch your nose when the whole thing is together - and it's fantastic," he continued. "I ended up having to walk three blocks in Atlanta heat with that 60-pound monster on my back, but hearing people cheering from the balconies above made it all worthwhile." But once Krix had his "fun" at Dragon*Con and then used the suit for some amazing cosplay photos with his fiancee, he didn't keep the suit around for long. He said it was just too big to keep around, so after a couple of months of sitting in his garage he sold it to a private collector in Taiwan.